In high school, when it was time for me to apply to colleges, I knew exactly where I wanted to go. I pictured myself exploring the dark corridors, admiring the ancient portraits that appeared to follow me along my path to my room or to the Great Hall, where I would eat my meals with other students and professors. It sounded so magical! Okay, fine, maybe that’s because I pictured myself going to Hogwarts. But it was purely for the aesthetic qualities of pursuing higher learning in a place filled with history and wonder. When I accepted this was an impossible dream, I settled for my “backup” school and am perfectly happy with the education I received there, even though none of my classes were in a castle tower. When I started dreaming of how I wanted my new classroom to look, I still had this ancient image in my head. 5th graders seemed so much older than the 2nd graders I had taught for the past 7 years. Maybe they would appreciate this, as well. How could I accomplish this in a school that’s only 8 year old, though? It’s not like we’re in the running for being named a historical landmark. 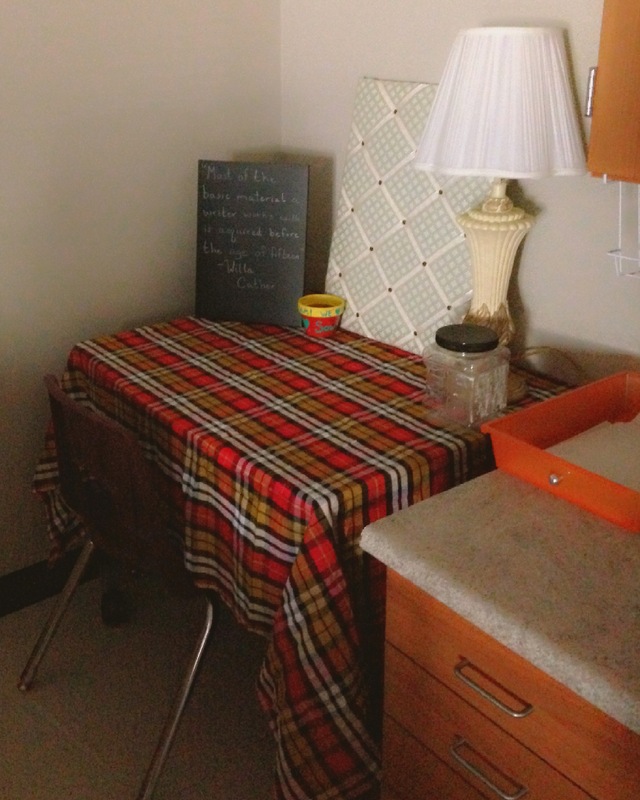 After enlisting the thoughts of friends, I came up with a few simple ways to transform my room into something that isn’t exactly like Hogwarts but at least feels like a warm, homey, and inviting place to be. I hope you enjoy the tour. (Disclaimer: These pictures were taken on my phone, and while photography is something I hope to get better at, with practice, I am not yet where I’d like to be. So, please forgive the glares and reflections you’ll see in many of the shots). First, I feel like you’ll be more impressed, if we do some before and after pictures. These give you an idea of the space (and amount of junk) I started with. Before shot, from the angle of the window. Before shot, from the angle of the doorway. After shot, from the angle of the doorway. As for the details, I printed and framed some old looking pictures to hang above my bulletin boards along with some fabulous old brass plates (each was less than $5 at my local thrift store establishments). 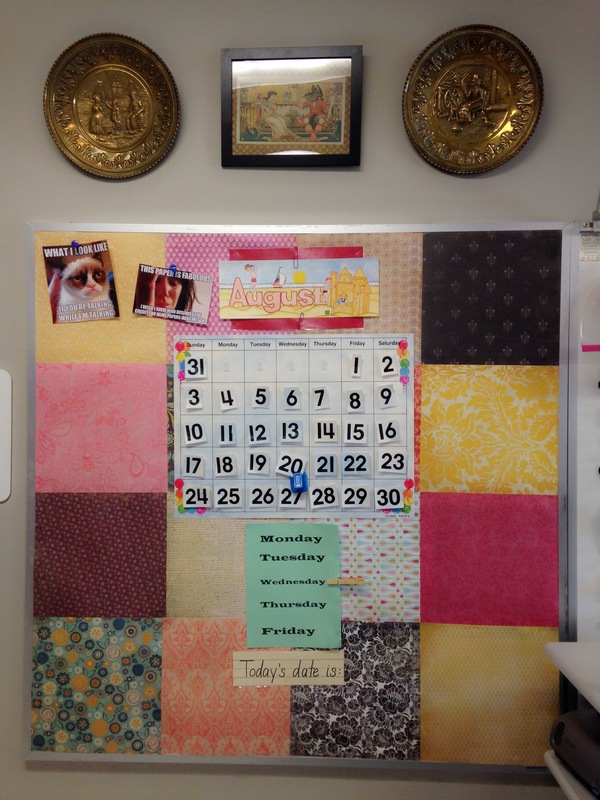 I also used scrapbook paper in warm colors and with tapestry-like designs for covering the bulletin boards (these last longer and have less fading than butcher paper). As for the pictures I chose to put in the frames, I found some that looked medieval to go with the castle look. The picture of the lady in the white robes in the gold frame is an homage to “the Fat Lady” who guards the Gryffindor tower. 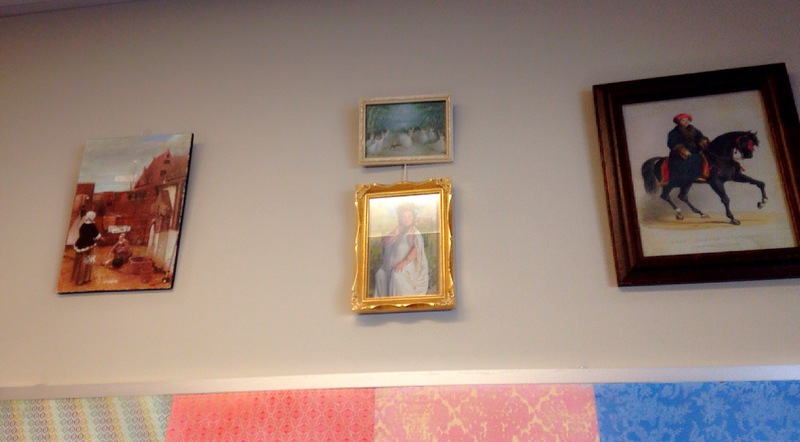 I hung framed prints above the bulletin boards to make it more homey. 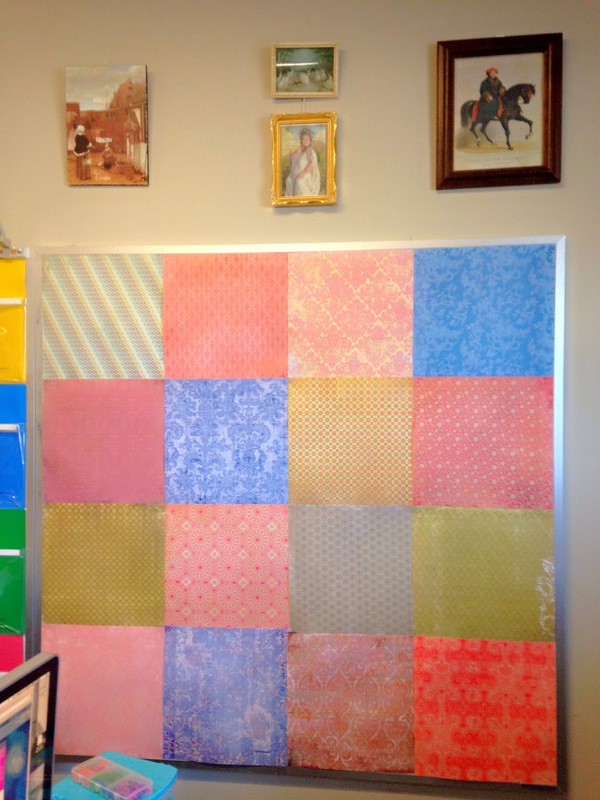 I covered the bulletin boards with some scrapbook paper in warm colors and tapestry designs. 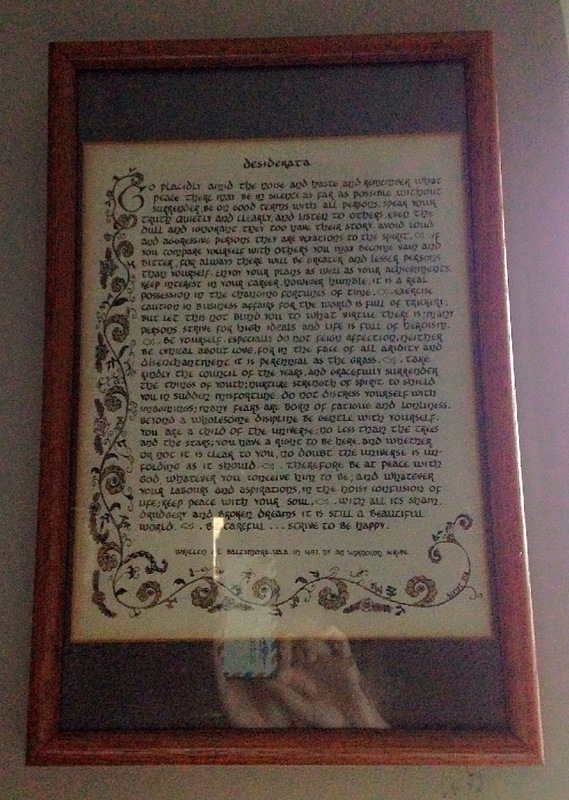 I was beyond excited to find this framed poem, entitled “Desiderata” by Max Ehrrmann, at the local Goodwill, because it reminds me of my 6th grade math teacher. You see, she was a little old school, and she had some unusual methods for classroom management. When our class got a little rowdy or loud, she would calmly tell us to put away our math materials and get out a new sheet of paper and pencil. When we heard those directions, we knew we were in for it. Then she would start reading aloud this poem…very s-l-o-w-l-y, and we were supposed to write it down word for word from her dictation. It starts “Go placidly amid the noise and haste, and remember what peace there may be in silence” and goes on like that for 20-something more lines. I remember the groans of all my classmates when she would start reading those words. I probably won’t be utilizing it for discipline in my classroom, but having it on my wall will give me a reason to chuckle. Two more special areas I want to highlight are my lockers and my Writer’s Nook. I added some visual height and interest to the room by putting some covered trifolds on top of the lockers. I saved these trifolds for the last 6 years from school science fairs and covered them with scrapbook paper and fabric. Eventually, I want to put directions for centers on them. I also established a corner of the room for a Writer’s Nook. One of my summer projects was establishing a cozy place in my home for writing and creating, and I thought my students might appreciate having a space for that, as well. I’m picturing that the picture holder and the chalkboard could be places where students will write inspiring quotes or ideas to encourage one another. So, that’s a little tour of my classroom. It will always be a work-in-progress, so there are still tons of improvements I can and will make. Overall, I’m pretty satisfied with it, though, and I hope it will be a happy place for my students and I to spend our days. love the toile patches on the bulletin board, also the art. Desiderata is a blast from the past (70’s).